Growing up in Japan and India allowed Anna the exposure to the spirituality of the East from an early age. She studied Humanistic Astrology, Polarity Therapy, Herbalism, and both Iyengar and Kundalini yoga. 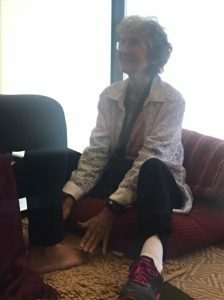 Her interests led her to the Southwest Institute of Healing Arts in Tempe Arizona where she completed her certifications as a Master Toe Reader and as a Hypnotherapist. Anna’s style has been described as gentle and supportive.